Dear America, we greet you as Christians who believe that freedom in Christ means that all persons deserve respect and equality before God and the law. Today, we pray for Ferguson, the family of Michael Brown, and for people everywhere who are impacted by racism. 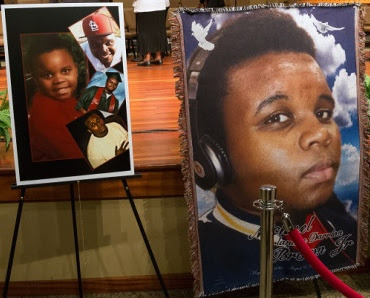 We write to you as spiritual leaders of Metropolitan Community Churches (MCC) and join with the millions around the world who grieve the death of Michael Brown, who shot down with eight bullets while unarmed and holding his hands in the air. We grieve that the grand jury felt there was not even enough evidence to have this case go to trial. We grieve that so many people are in denial about the realities of racism today. MCC was founded almost 50 years ago to provide a spiritual home to lesbian, gay, bisexual, transgender, and queer people. We have been a target of hate, and we come from all races. We know all oppression must be challenged because every person is created in the image of God. It is time for all faithful people around the world to pray and act to end racism. As Christians, we remember how Jesus was challenged to go beyond his own cultural prejudice by a woman who was of the scorned Canaanite race. (Matthew 15:21-28) We remember the lives of so many African Americans who heard the Gospel and knew they were meant to be free. We remember all those of every race who have been willing to stand up — and even lay down their lives for freedom and justice — regardless of race, language, or identity. As citizens of the world, we decry the use of war equipment to attack peaceful demonstrators. We stand up and speak out against the systematic criminalization of people of color. Just as Jesus overturned the tables of power and exploitation, surely Jesus would condemn a system that targets people by their skin color and economic status. Black people are arrested and incarcerated six times more often than whites. The unemployment rate for Blacks is twice that of White people. White households have six times the wealth of African American households. Transgender women of color are more likely to be murdered than any other group in the U.S.
African American same-gender couples live in poverty six times as often as white same-gender couples. Black women couples are three times as likely to be poor than white women couples. Humanity has the power to do great good. Systemic racism can be dismantled. The Berlin wall was toppled. Apartheid was overthrown. Nazi Germany was defeated. Slavery was stopped. Systems of oppression are constructed by human beings and can be deconstructed by human beings. Will it be easy? No, but like every good thing we work for, it will be worth the effort. Our only regret will be that we did not act more quickly. We urge all people of good will to ACT TODAY.